One of the projects I made for my Display Stamper application was a little ambitious. Not that it was hard — the Gift Bag Punch Board makes bags in a snap — but that it was so time-consuming, and I had about a day to gather and/or make six projects. Still, I couldn’t resist! Do you see the lovely, colorful paper? Well, it comes black and white. Yes! This is one of the Sale-A-Bration products, the Inside the Lines designer series paper. You get twelve sheets, three each of four different designs. They’re beautiful pages and coordinate perfectly with the Dragonfly Dreams bundle. And the best part is you get to color the paper yourself! I colored mine using the new Watercolor Pencils and a Blender Pen. I think an Aqua Painter would be too wet for this paper — it’s thicker than regular DSP but not so thick as to take a lot of water without pilling. 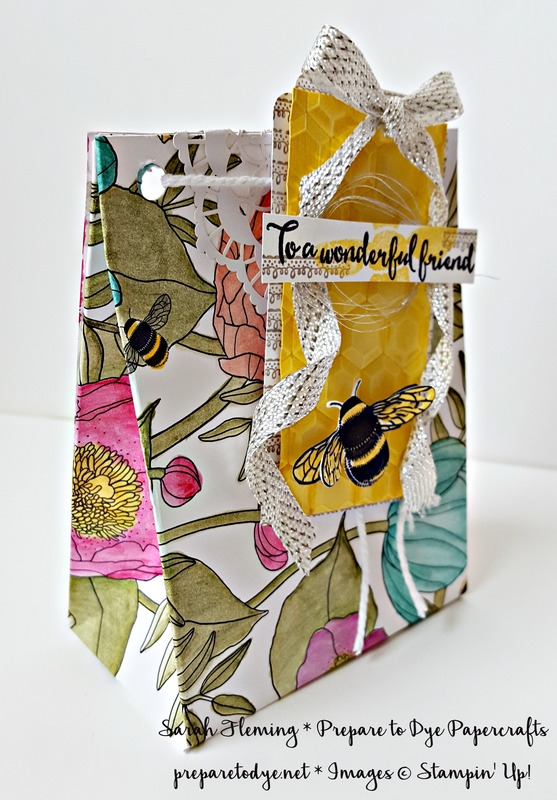 I made the bag using a 6″x12″ sheet of paper and the Large size markings on the Gift Bag Punch Board. I colored the paper first — that took a while, but if you’re into the all-the-rage adult coloring books, how much more fun would it be to add a small piece of your work to the front of a card, or make a bag out of it, and share it with a dear friend, than to stick it in a drawer somewhere? I’m so excited to give this bag to someone special. I’m not the best at coloring Inside the Lines myself, but I think a friend would still appreciate this bag, even with all my little coloring mistakes. I did punch the holes in the top of the bag (the reverse side of the punch board punches these holes). I tied the bag closed with Thick Whisper White Baker’s Twine and also put Glue Dots at the corners to hold it closed a little better. 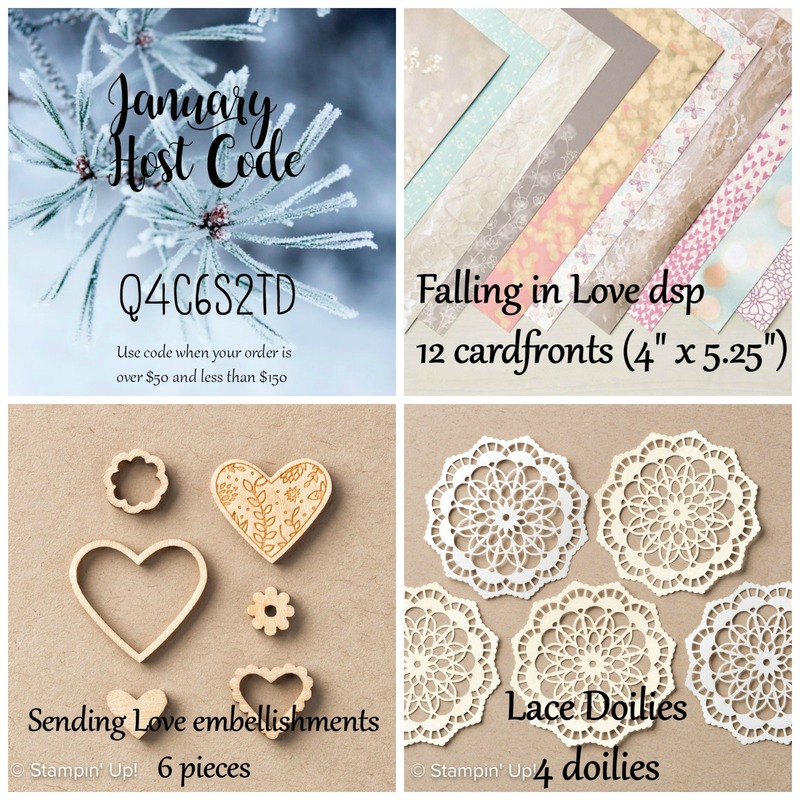 Under the twine and tag is one of the new Lace Doilies. I’m in love with these! They’re Whisper White on one side and Very Vanilla on the other. This tag features two different Sale-A-Bration freebies itself. I stamped the Whisper White tag from top to bottom with a stamp from the Delicate Details stamp set, in Tip Top Taupe ink. These gorgeous border stamps make wonderful finishing touches on so many things — you’ll see me use it so much during Sale-A-Bration. I think it’s one of the absolute must-haves from Sale-A-Bration this year, maybe even my number one recommendation. 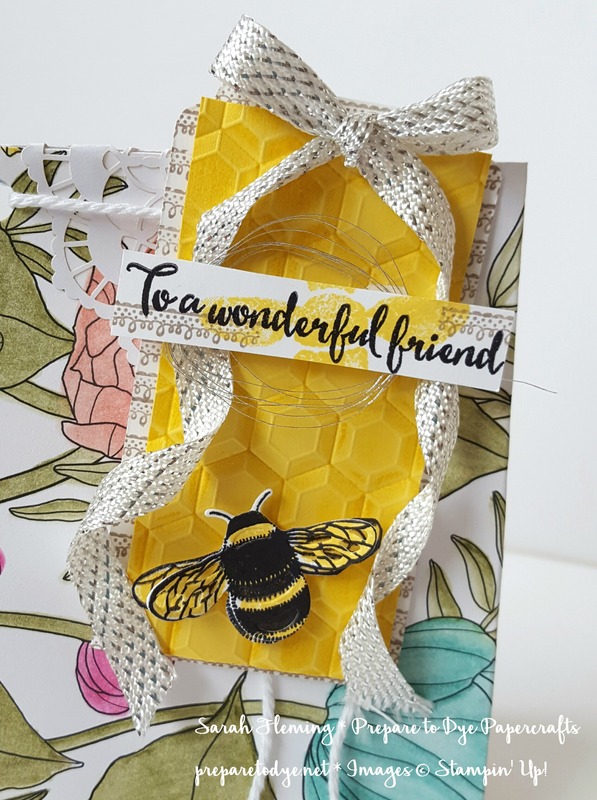 I ran the Daffodil Delight layer through the Big Shot with the Hexagons Dynamic embossing folder — the extra-deep impressions of these dynamic folders just add so much more to every project! Before I ran the Daffodil cardstock through, I inked up the embossing folder with the Daffodil Delight ink pad, just swiped the ink pad across the folder — it shades the impressions a little and amplifies the effect of the deeper folder, don’t you think? 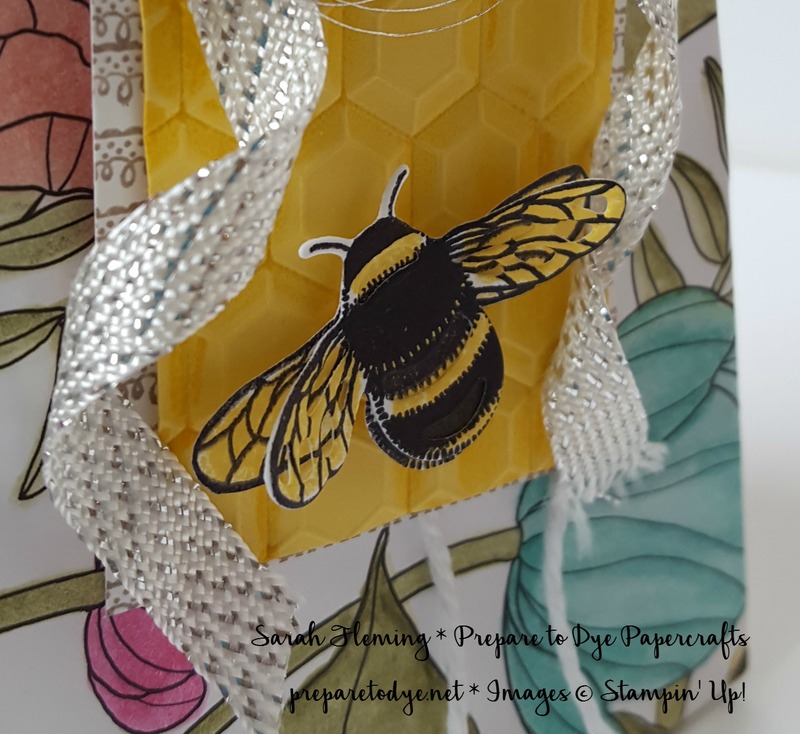 The bee on the tag is stamped and die cut using the Dragonfly Dreams bundle. Isn’t he cute? He’s two stamps — the black is one stamp, and the Daffodil Delight is another. If you look at the sentiment strip, I’ve also stamped the Daffodil Delight solid body stamp behind the sentiment. I stamped both parts of the bee twice, cut the first bee out with snips, and cut the second one out with the coordinating die. I glued the body down on top of the first bee body but left the wings free. I fluffed them up a bit so you get a 3D wing-flapping effect. I added the bee to the tag using Dimensionals. The sentiment is from Dragonfly Dreams, and the Tip Top Taupe lace on the sentiment strip is the same stamp from Delicate Details. Before I tacked down the sentiment with Dimensionals, I added some Silver Thread to the back of the sentiment. The ribbon at the top of the tag is another Sale-A-Bration freebie! It is GORGEOUS in person. Wait until you see it colored. I’ve dyed it a couple of different colors, and I will show you soon. It’s so pretty! You get this white/silver ribbon and also vanilla/gold ribbon in the same pack, five yards of each. To get the ribbon to curl and lay like this, I wet it down with a clear Aqua Painter until it did my bidding, then dried it with my Heat Tool. You can earn any of the SAB freebies I mentioned by placing an order of $50 or more in my online store. And don’t forget that anytime you order $50 or more from me using my Host Code, you also get my free gift.